Hurricane Michael caused extensive damage in the Florida panhandle at the beginning of October, including knocking out regional oyster production and washing out to sea and capsizing a nearly-completed, 261-foot trawler being built for Glacier Fish Co. in Panama City, Florida. 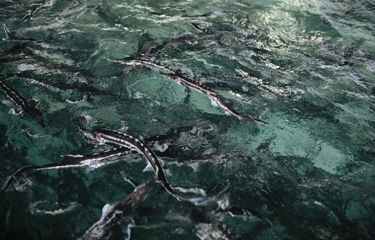 Sturgeon Aquafarms breeds and harvests sturgeon, including the endangered beluga sturgeon, while its sister company, Marky’s Caviar, markets the sturgeon meat and caviar produced at the Bascom facility. Sturgeon Aquafarms, LLC | Bascom, Florida – USA © 2017. All Rights Reserved.